175*57*32.2mm/pcs,gift box:240*230*70mm,20pcs/ctn(505*365*485mm) we can accept customized design and different size for carton box. 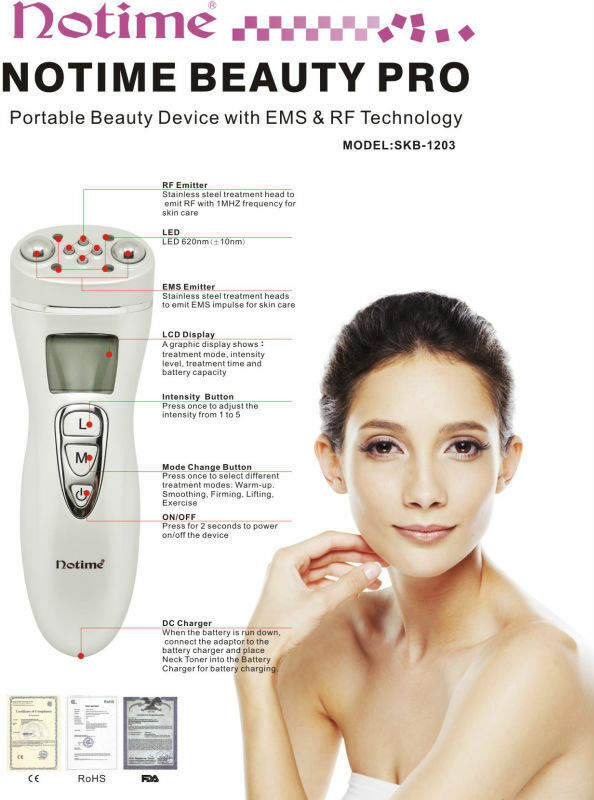 Your best choice for EMS & RF portable beauty device, with multifunction 5 in1 , 5 intensity levels and graphic LCD display .Just 3 minutes each step, enjoy professional facial spa at home, make your skin always shines with youth and beauty. 1. 3 minutes treatment per day. 2. 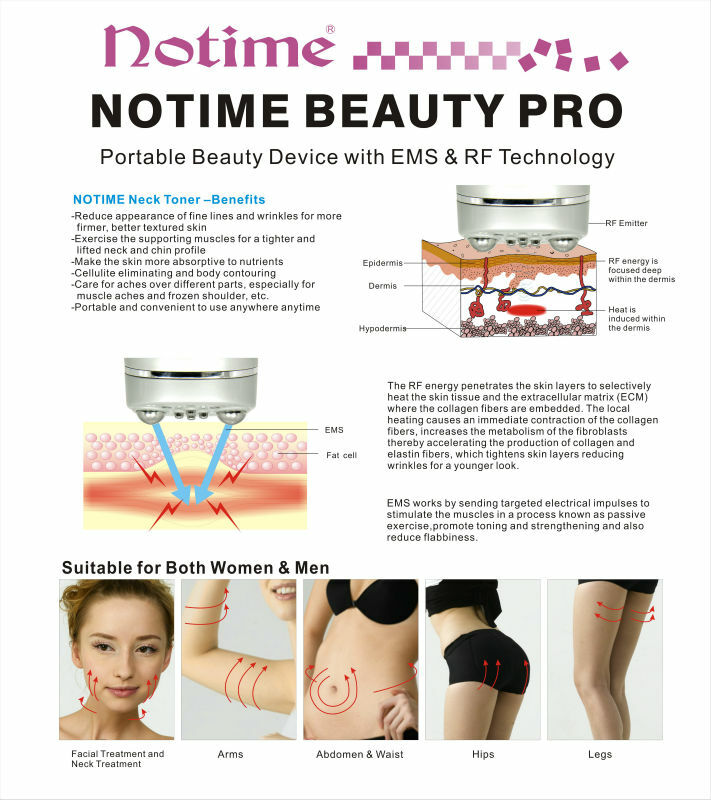 3 advanced technology: Galvanic, EMS & RF combined together. 3. 5 treatment steps: warm up, smoothing, cultivating, firming, exercise. 4. 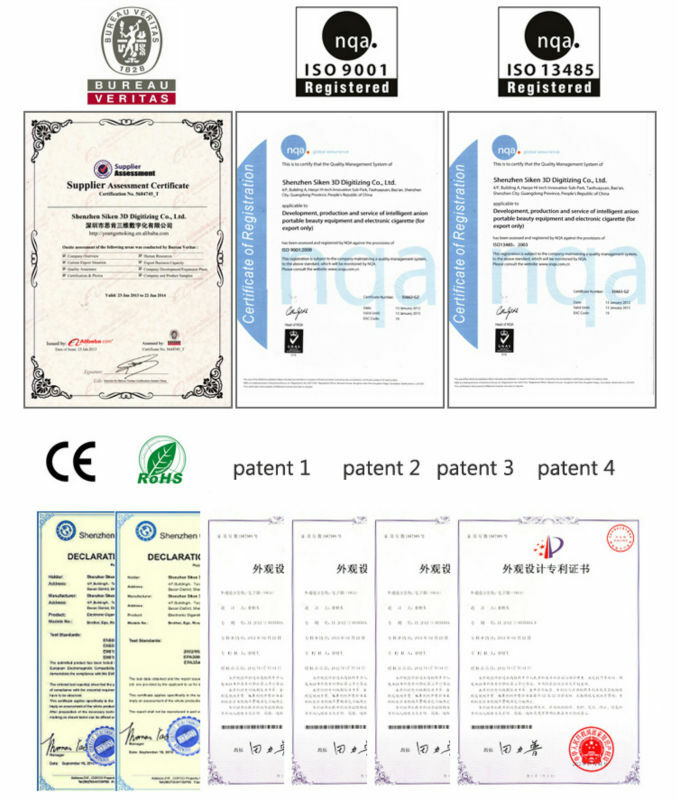 4 intensity level for facial care. 6. 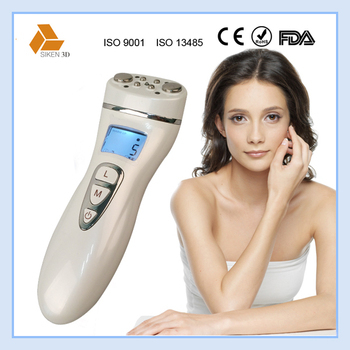 Multifunctional, can be used for facial skin care and regulating body shape. 7. LCD display screen shows working status. Apply the device inclined to the chest, aim at the shoulder joint below the clavicle. 3 minutes for one side, total 6 minutes for both sides. 1-month concentration treatment course. People who have time to do treatment everyday are suggested to challenge this treatment course! Warm up the skin throughout. Straighten out the warmed up skin, create smooth skin. Tightening skin through abundant EMS stimulation. Stimulate the already firmed skin with rhythm. In order to maintain the facial and body line, please continue doing maintenance at exercise mode for 2-3 times per week. 2-3 times per week are suggested to challenge this treatment course. Treatment time limit: 1 time per day for each part. (Shall no more than 3 minutes) Please do not do treatment over above time limit. Please make sure not to use the device aim at the center of the throat, around eyeballs or on eyelids. 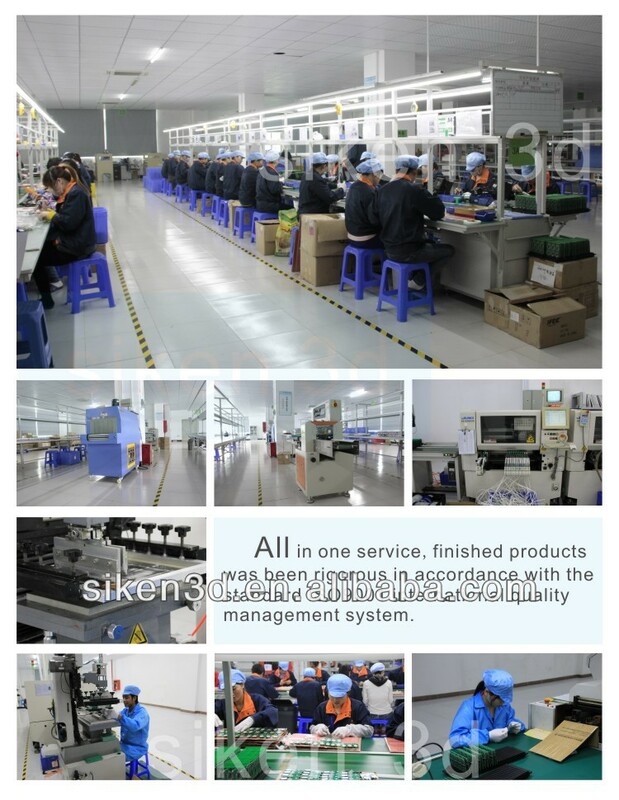 Siken 3D has been producing and supplying OEM/ODM beauty device production over 10 years.As oriented-factory Siken 3D has its own R&D team, production lines under quality control of ISO9001 and professional sales team. We had received good reputation among all of our customers from domestic and abroad. 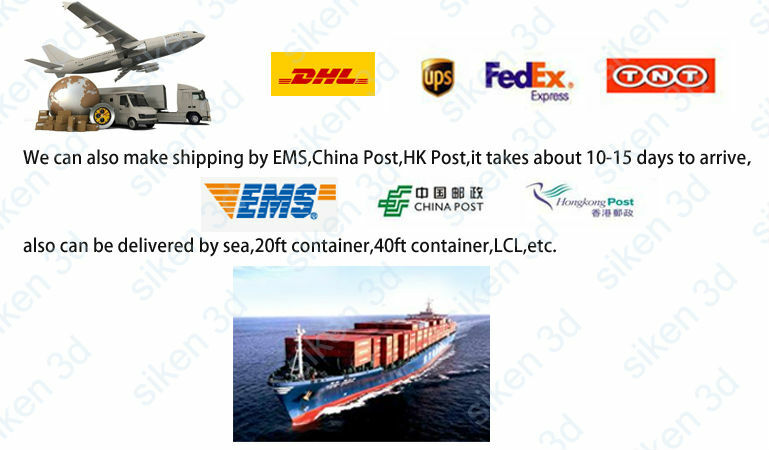 5.What is Advantages of Siken 3D? 1) For most of the items are in stock,we can arrange immediate shipping with international express as DHL,UPS,FEDEX,TNT to worldwide,it takes about 3-7 days to arrive. 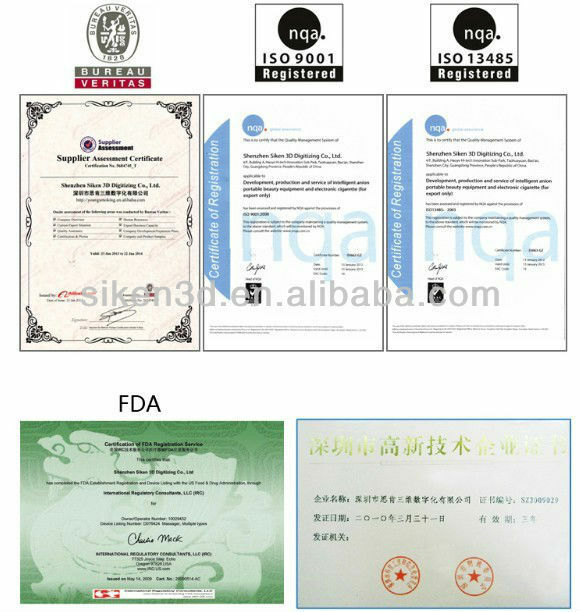 2) Bulk goods can be shipped under your suggestion.If you have forwarders to suggest,we will contact for you.If you need us to recommend,we will also offer better shipping agent for you. A: Paypal & W.U. are ok. We arrange delivery in 1-3 working days upon payment and ship by DHL/UPS/TNT etc.It will be arrived in 3-7 working days. 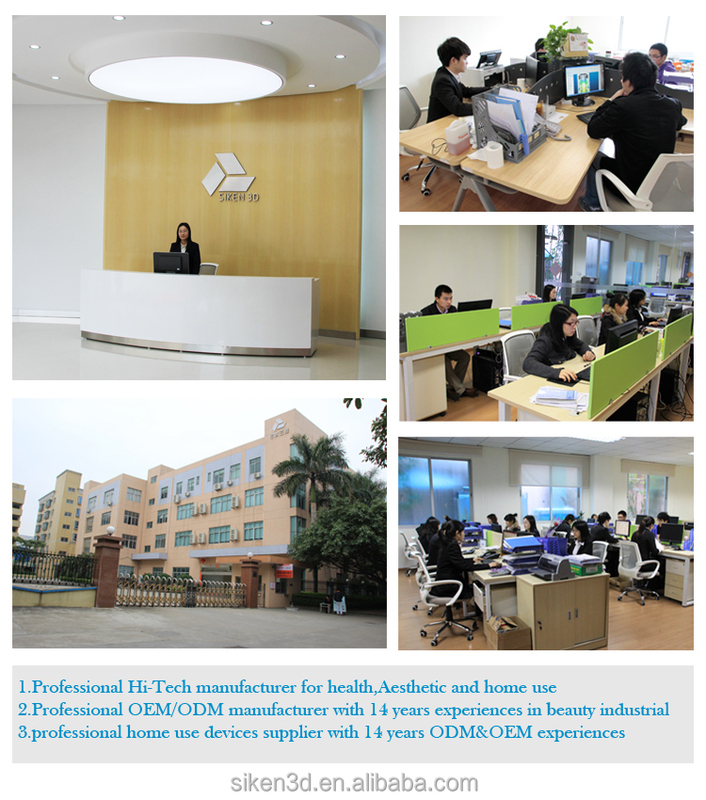 A: We are professional manufacturer with our own R&D team. OEM & ODM are available. A: 17-25 working days upon payment.